Sometimes we just need to add a little mystery to our lives - even if we have to create it. For example, what does an outdoor piano, five sailboats, a house built in a week, and a buried motorcycle have in common? For one thing, they are all things seen this week in and around downtown Rockport - and at least one of them contains a real mystery that you might be able to help solve. discussing the progress on the community piano. You could find several artists working all week on this musical art piece. 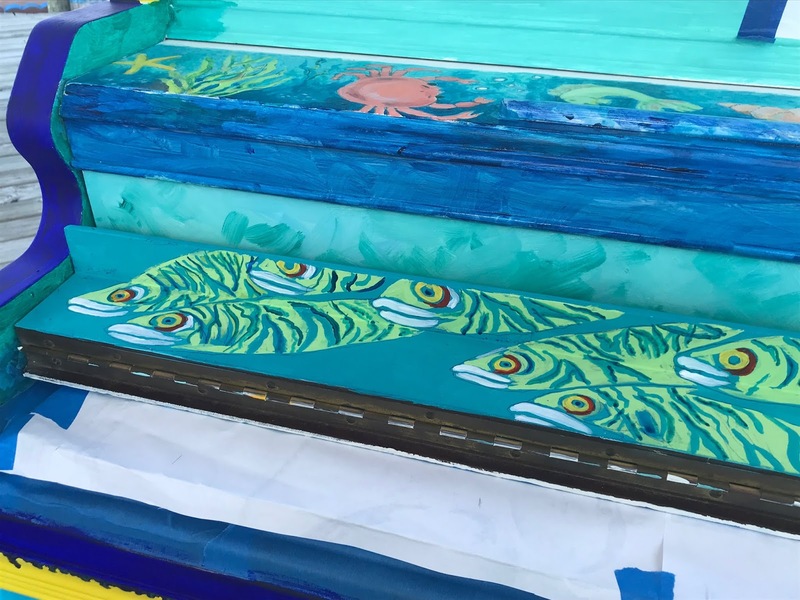 This hand painted community piano will add a little musical art to downtown this summer. 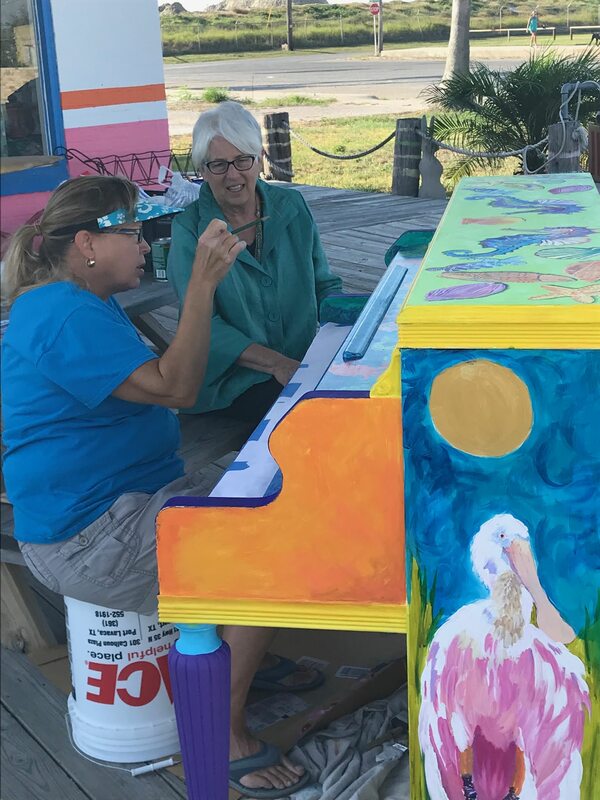 It is a project being sponsored by the downtown Cultural Arts District's "Tune into Downtown Rockport." 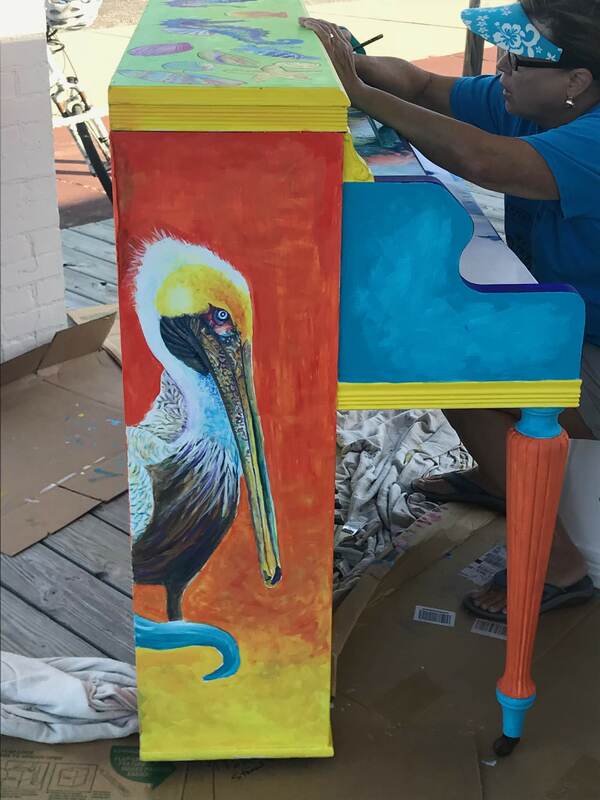 Several professional artists have been donating their time all week painting the donated piano before it gets placed on Austin Street at the southeast corner of Main and Austin. The piano will be there all summer and anyone who wants to come give it a play is welcome to do so. While you are downtown, be sure to check out the Second Saturday events being put on by the downtown merchants and the outdoor Art Market sponsored by the Rockport Center for the Arts. And, who knows, if you come for the piano unveiling Saturday at 10:00 a.m, there may even be some mystery players showing up. 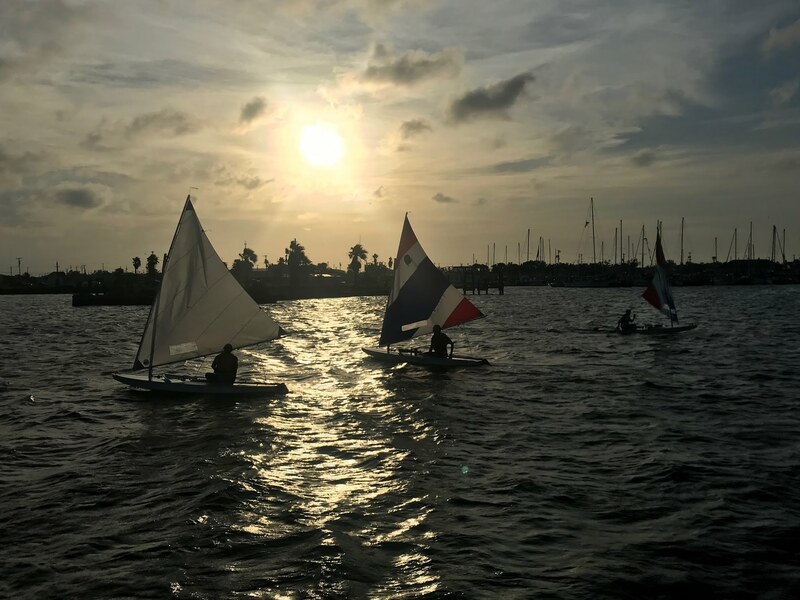 The Rockport Yacht Club kicked off its Summer Sunfish sailboat races this past week in the Rockport Harbor. The Tuesday races are open to anyone wanting to join the timed races. The small sailboat races can also be viewed from the deck outside the yacht club in Rockport Harbor. 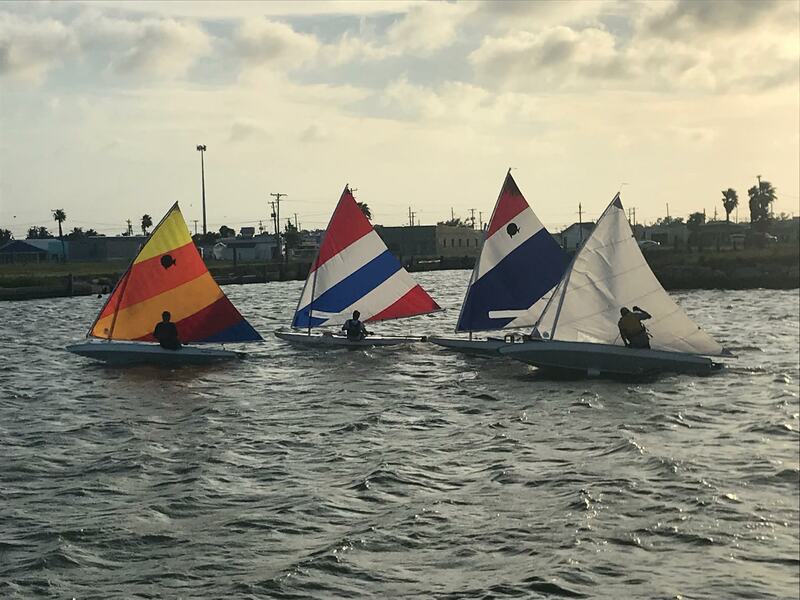 It's a great way to spend a few hours, watching as the young and "older" sailors compete, going on routes around the harbor and finally out past the harbor entrance. Even though this week's racers were dealing with high winds, they took it in stride, helping one another when someone got in trouble and cheering each other on. The big mystery with any sailboat race is how high the winds will get, which boats will end up on their sides, and which one will be the winner. Four of the five racers in Tuesdays race, ready to go. Everyone is invited to watch from the deck at the Rockport Yacht Club. It is hard to miss at the far south end of Magnolia past downtown, its unusual round structure causes it to stand out among the more angular buildings we are used to seeing. 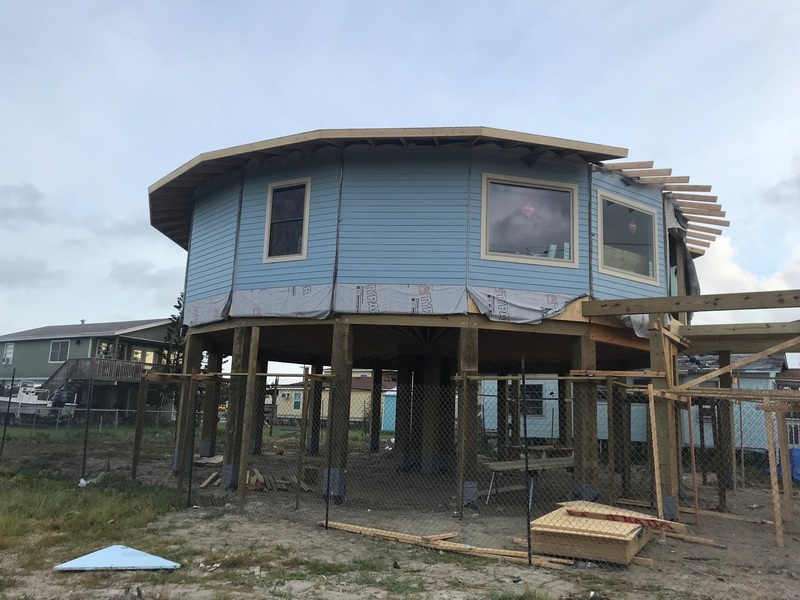 My husband and I spent more than a year trying to get one of these hurricane resistant homes built in Rockport, but couldn't find a builder to put it up. So it was exciting to see this Deltec house going up near downtown, the result of a new partnership between a local builder and Deltec. At the time these pictures were taken, they had only been working on the house for 6 days. The walls came from their factory in Asheville, North Carolina already assembled, complete with impact windows and siding. 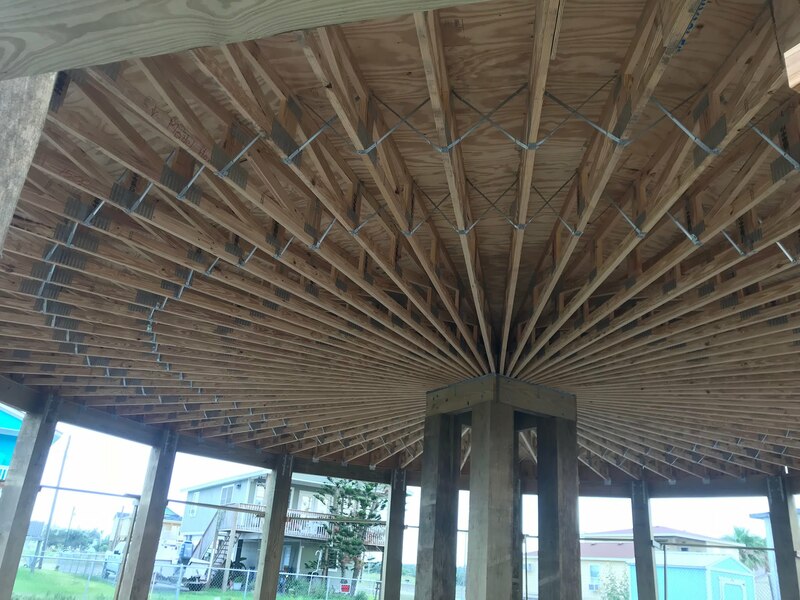 Once the pilings are up, they are able to dry the complete house in in about a week. If you can't figure out how you can put up a house in a week, check it out for yourself, since the home they are building will be used as a model home. It's worth a drive down Magnolia to see it - plus this is the spot where the real mystery is located. 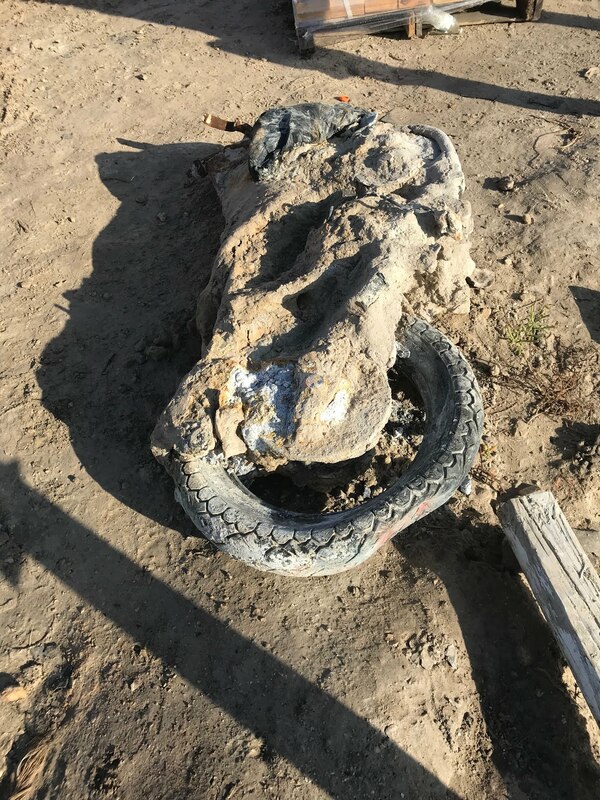 The buried motorcycle. They started putting this house up 6 days before the picture was taken. From the looks of this, it doesn't look like it is going anywhere in a storm. Hardly recognizable for its past life as a motorcycle. It is still a mystery why this motorcycle was buried four feet underground. While I was taking pictures of the Deltec in progress, I spotted what looked like something metal encased in concrete. 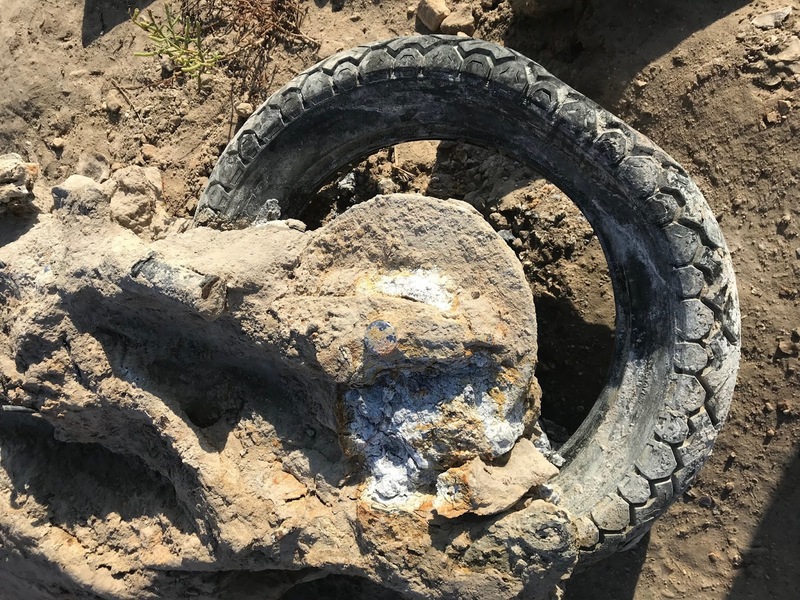 Upon closer inspection, it became clear that it was a motorcycle that had been buried for so long that it was practically welded to the packed dirt surrounding it. One of the workers explained that when they were digging the pilings, they discovered the motorcycle buried four feet below the surface. Why exactly would someone feel the need to bury a motorcycle? Was it stolen? Was it connected to some other crime? Surely someone out there has some clues to help solve this mystery. So, now you know what the piano, the sailboats, the house, and the motorcycle have in common. They all four have elements of mystery about them - if you look hard enough. But the best part is that they are all four in or near downtown - so you can check them out for yourself. And who knows, maybe doing so will add a little mystery to your life too.